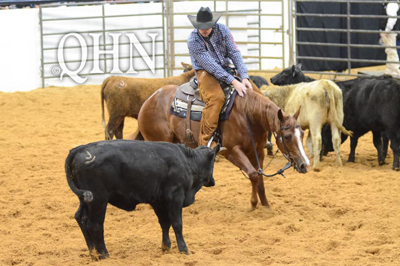 The final week of the National Cutting Horse Association (NCHA) Futurity is underway, and Session I of NCHA Futurity 2-Year-Old Sale took place on Dec. 5 in Fort Worth, Texas. Hip No. 1024, Metallic Quintan 014, brought a final bid of $100,000, making her the highest seller. The filly, who is by Equi-Stat Elite $10 Million Sire Metallic Cat and out of the CD Olena mare Quiolena, was consigned by Wes Ashlock, Agent. Metallic Quintan 014 is a half-sister to the great mare Quintan Blue (by Mecom Blue), who was the 2004 NCHA Futurity Open Reserve Champion and went on to earn $609,140. Some of her other half-siblings include Mecom Bay Roan, an NCHA Futurity Open finalist who is also by Mecom Blue and has earnings totaling $94,579, and Quiaheaven (by Mr Peppys Freckles), who garnered $25,641 in the show pen from 2009 to 2015.